A crowd of more than 20 Eastern Region spectators watched as three new drivers took up the challenge to get behind the wheel of Project Merlot. The novice track day at Snetterton on Saturday, March 10, showcased just what the club's budget-build racer was designed to be - a unique opportunity for members to have more fun. Steve Hider, Tony Brown and Ian Ward signed up to be on the driver list, alongside track day veteran Martin Curtis. The car's other owners Robbie Marsh and Jon Elsey were also on hand to ensure that everyone's adventures in the lightweight Mazda went as smoothly as possible. There were tense faces and a few quiet moments after the 8.30am safety briefing, then Martin handed over the keys to the three who had never driven on a track before. First were a couple of siting laps for drivers to familiarise themselves with the two-mile track, first to climb into the snug driver's seat was a nervous Ian. He returned 15 minutes later with a big grin on his face, and reported that he found the chicane quite confusing the first time. He said: "I'd been round as a passenger with Jon before so that helped. To be actually driving was good, very good." He added: "I think there's a lot more speed left in Project Merlot - I haven't used it all... yet!" He had contended with all sorts of other cars from Porsches and a Maserati, to Caterhams and a custom-built yellow peril with a highly-tuned bike engine. As a bright green 2CV raced past the pits, Steve laughed: "I'm just happy there's something like that on the track - it gives me more of a chance!" After his first laps, his verdict was: "Absolutely brilliant, I loved it. Now I can't wait to buy my own car for the track." As a paramedic, Tony is trained in advanced driving techniques but he said: "I usually drive defensively so this is certainly different." Following his first laps watched by his son, Tony admitted: "I was a bit nervous. I realised you feel very small with all these bigger cars around you, so I found that a bit disconcerting. But it was really good, I can't wait to go out again." After his next drive his smile spread even bigger as he said: "My verdict is fun, fun, fun, fun, fun, fun!" 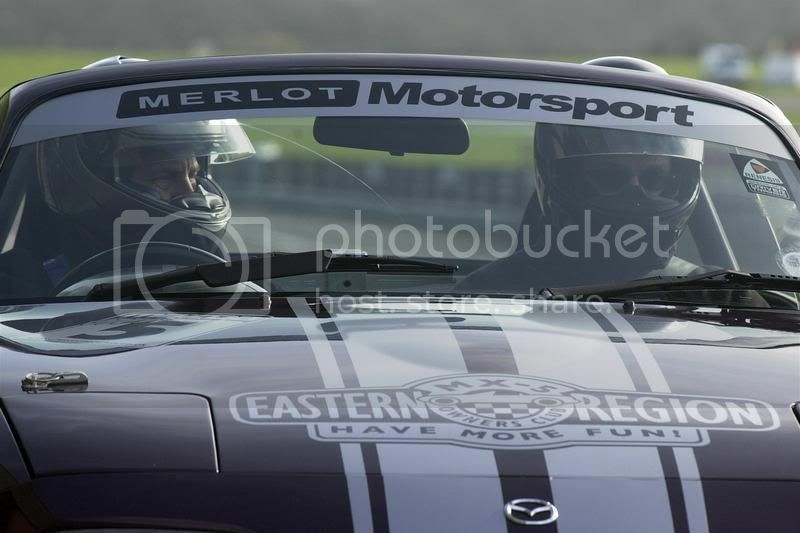 Passengers got great value for their £10 Snetterton fee, with many opportunities to ride with the various drivers. Mandy Huggins first accompanied Steve, and he said: "I could hear she was enjoying it so I decided to go a bit faster! Unfortunately every time we caught up with someone they turned into the pits, so I didn't get to overtake much!" Mandy said: "For the first lap my foot kept trying to brake, then I told myself 'Just relax Mandy' and then I was so relaxed I was rolling around all over the place!" Kendra Dixon was sitting alongside Tony when the Merlot suffered it's only spin of the day - a full 360 degrees with the car behind following suit. "The spin wasn't worrying," she said. "But the Porsche spinning and drifting towards us was quite scary. I was wondering how we were going to explain a Porsche-shaped dent in the Merlot to Martin, Jon and Robbie." Fortunately, the feared impact never occurred and racy roadster was straight back on the track. Tony suggested his spin could have been due to a twitchiness caused by Robbie and Jon stiffening the suspension during the lunch break. Technical guru Robbie, who kept the car running all day, said: "If someone smashes it nobody will be upset - but we will take the mickey out of them forever, from now on." Robbie who had also adjusted the engine's timing to try and eek a bit more power added: "It's quite relaxing for me to stay in the garage and not drive, I'm really enjoying today"
Ken Ward and Kevin Allen both took the opportunity to drive their own cars on the track again. By the afternoon session 33 cars were participating, close to the circuit's maximum of 38. "It's really busy out there today," said Ken. "but it's good fun." Jon said: "Today summed up what the original idea was all about. "It was great to see Merlot being used as it was always intended and I hope that Ian, Tony and Steve got as much fun out of their day as I know Martin, Rob and I have in the past." During its time on track Project Merlot notched up 294 miles using £90 worth of petrol - that's roughly 14mpg, perhaps we ought to approach Shell for sponsorship! Watch this space to see when the Merlot's next outing will be - and contact Martin if you want to apply for a drive.